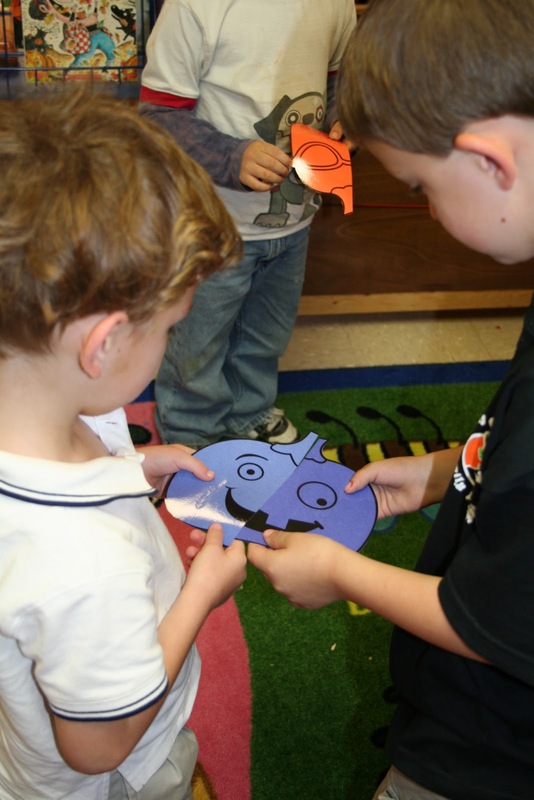 Mrs. Lee's Kindergarten: A REALLY Long Post, but LOTS of Stuff! It feels like it's been a while since I've actually made a real post...we have been super busy in our classroom! I cannot believe I am teaching Thanksgiving...where did the first day of school go? It seems like it was yesterday! Here are just a few of the things from last week and this week that we have been doing. 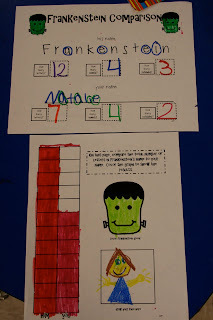 Here we are completing our Frankenstein name comparison activity that you can find in mine and Deanna's Autumn packet. I hung these along with our Frankensteins by Deanna...I didn't do the glyph part, but thought it went perfect with this name activity. 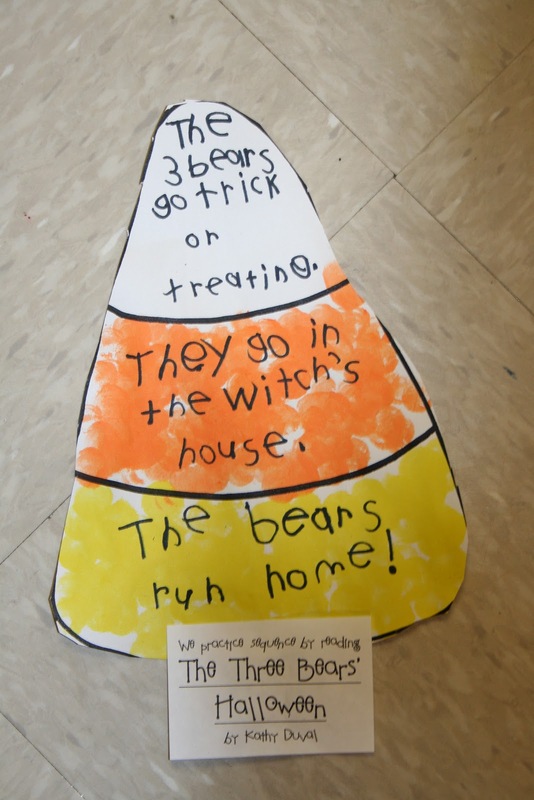 We read The Three Bears' Halloween and practiced our sequencing skills using this big candy corn. 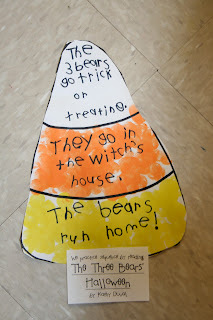 And, of course, we retold the story with real candy corn then ate it! We also made a venn diagram to compare this story to the original Three Bears story. We read The Little Scarecrow Boy and made these cute little scarecrows. 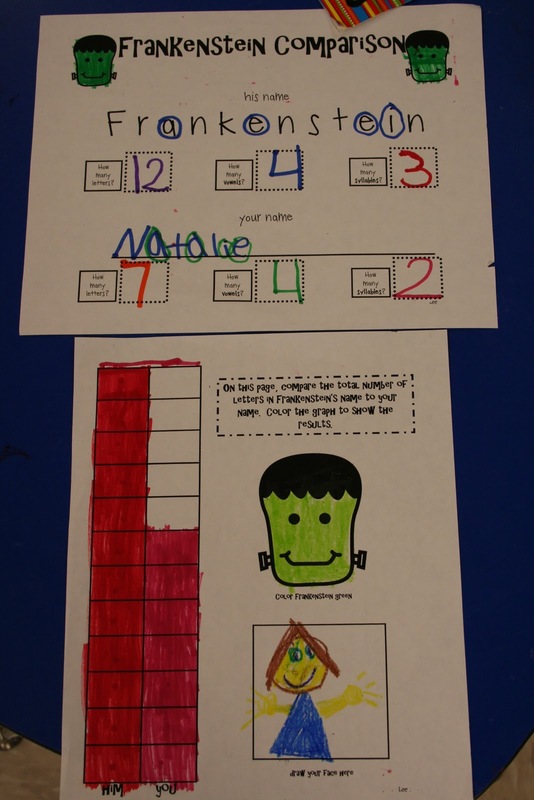 Each student chose which face they would make to scare a crow and then drew it and wrote it on their paper. Here a just a few of our centers that you can find in my upcoming Thanksgiving Unit...it isn't posted yet, but hopefully tomorrow! 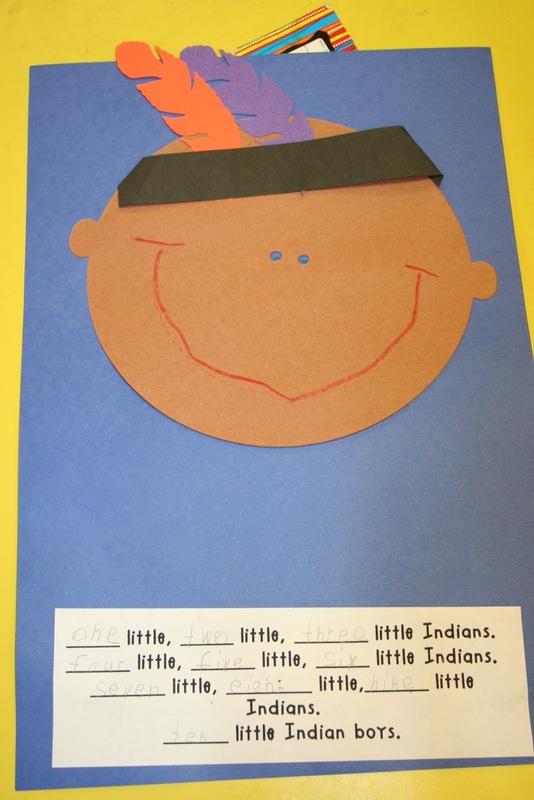 We make a Thanksgiving Fact book that turns out sooooo stinkin' cute! Here are the first 3 pages we've completed. We are practicing learning our number words and we made this cute little guy...it may be hard to see, but we wrote each number word to fill in the song. During whole group math we matched the pumpkins below so that each were symmetrical, then we completed this little recording sheet! Finally, check out these three blogs...I teach with all three of these gals and they are GREAT! Thanks for stopping by friends! I truly enjoy reading all of your sweet comments so keep them coming! My Thanksgiving unit is almost ready so keep your eye out AND many of you have asked about my gingerbread and Christmas things...they are up next! I just commented on the wrong post. Can you tell it's late on Friday night? 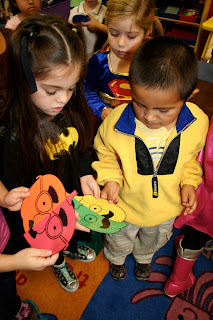 I want to be in your class - your projects are TOO CUTE!!!! Any chance you are going to add the symmetry activities to your pumpkinlicious unit? I would love to have those...they look GREAT! Love the Thanksgiving book you're making! Super cute! :) I would love to see the rest when they're finished!! This looks too cute, Julie!! You just keep creating such great ideas. We are doing Pilgrim stuff this week, so I will have to check it out! I love your pilgrims/indian/frankenstein. Are they from one of your TPT units? I am in charge of school Dec. bulletin. Could you point me to something similar that you might have at TPT for winter. (It's can't be Santa/Christmas - just winter) Thanks!! I would love to use the candy corn craft as well as the Pilgrim book, but I am not sure where to find them. Please let me know. These are nice artworks by the kids. It's really a good thing that this activity bring them knowledge and fun at the same time.